Incident Summary | A wildfire broke out on WA DNR lands. 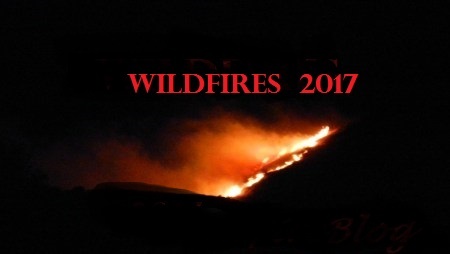 Fire crews were dispatched on Friday, July 7th @ 2250 hours PDT. Cause | Unknown and under investigation. Location | The fire is located off of Highway 141 and 5 miles North of Husum, Washington State. Resources | 385 personnel broken down to 13 crews, 13 engines, 9 dozers, 3 water tender and 1 skidder, plus 4 helos (1 Type 1, 2 Type 2 and 1 Type 3). Fire Fuels | Medium logging slash, brush and tall grass. Current Conditions | Fire behavior on Monday was described as moderate with some backing, creeping and isolated flaring. Fire continues to back down into the drainages and make short uphill runs. 322 acres destroyed but there is a 15% containment status gained. Traffic Alert! (1) | Highway 141 near Dry Creek Fire in Klickitat County is now open to traffic led by a pilot car between Mile Marker 14 and Mile Marker 17. Traffic Alert! (2) | State Route 141 remains closed from Milepost 12 through Milepost 21. Road Closure Alert! | Recreational access to White Salmon River remains closed from BZ Corner Boat Launch north to Warner Road and Sunnyside Road. Cost-To-Date | The total cost-to-date fire suppression and containment costs have reached $1.3 Million. Sometime during the overnight hours of July 10th 2017, unknown persons forced entry into Station 32. This is an unoccupied station that houses one engine, one water tender, and one brush/EMS vehicle. Station 32 (Cherry Lane) is supported by 10 volunteer firefighter/EMT’s and covers the community of Snowden, down to the boarder of the City of White Salmon and areas in to Husum and BZ Corners. 3. 1 Dewault extrication sawzall, chargers and blades removed from rescue equipment cabinet. Used value $500.00 with accessories. We ask that if anyone has information about vehicles or pedestrians in the vicinity of this facility, please contact the Klickitat County Sherriff’s Office immediately. Fire District #3 is a small agency with limited ability to fund critical equipment, facilities and other items. We cherish our volunteer members who are skilled and extremely committed. Having life-saving equipment stolen from our citizens is extremely difficult to comprehend and tolerate. It has also created a significant financial burden during a time when we are hosting a significant Wildland fire in our jurisdiction.